Dimension: 5", 6", 8", 10", 12"
Benefitting from the ability of our accomplished team, we are intensely indulged in offering Blue Pottery Plates. 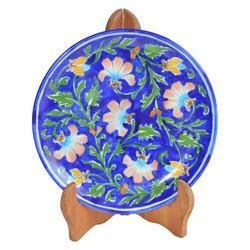 Blue Pottery Wall Plates are handcrafted and hand painted by skilled artisans. Blue Pottery is widely recognized as a traditional craft of Jaipur. The name 'blue pottery' comes from the eye-catching blue dye used to color the pottery. 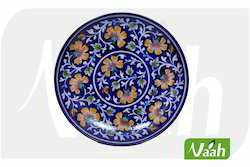 Beautiful combination of durability and presentation is the key of this plate. We are dealing in 100% Melamine crockery from Thailand.